Lollipops and childhood...inseparable! This outfit is as yummy as a lollipop! Pattern includes a halter babydoll dress with wool appliques and a darling pocket, short bloomers, and an oh so cute beanie! The body of the dress uses a jelly roll which gives you a huge variety of fabric without buying the yardage. Sizes 12 mos.-5T. 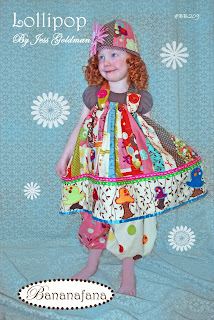 to die for.. i love it... we need to come over and show you the Lucy skirts we made.